In a perfect world, every body scrub would have just the right amount of exfoliating power, ultra-hydrating oils and tantalizing scents to keep me digging to the bottom of the tub day in and day out. Rachel’s Plan Bee Body Polish must have come from this perfect world, because of the nine (!!!) body scrubs in my shower right now, these are the two that I keep scooping my hands into and applying from head to toe every week. 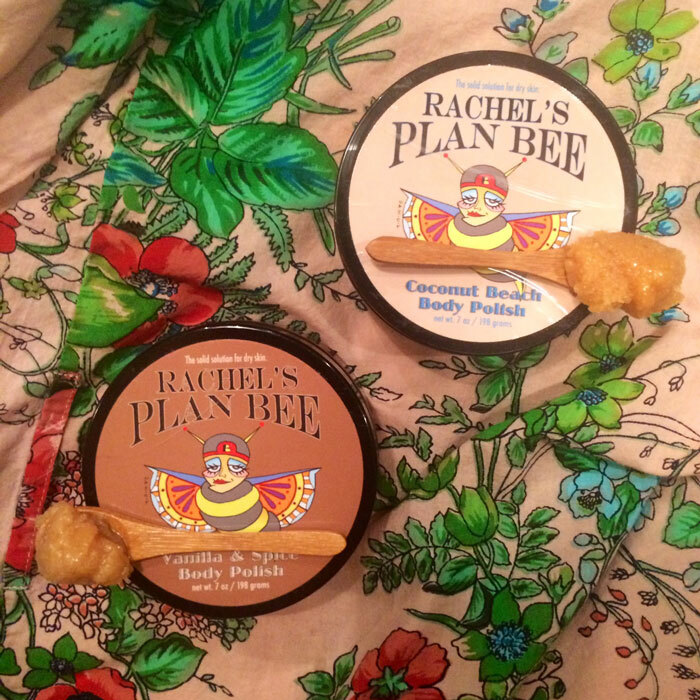 Rachel’s Plan Bee Body Polishes boast a whipped consistency yet feel substantial in your hands thanks to the uber-moisturizing base of shea butter, sugar and clay. It’s one of those rare body scrubs that isn’t totally drenched in oils (you know, the ones that coat your skin with a thick layer of oil that gets stuck under your nails if you scratch yourself). Instead, it imparts just the right amount of long-lasting oil on your skin after you’ve rinsed off the scrub, and while your tub will be a bit slippery, it’s still not as slippery as some scrubs can leave your tub. This is likely thanks to the addition of clays such as kaolin and Moroccan lava which absorb excess oil. Some body scrubs can also feel super-chunky because of the size of the sugar crystals used; Rachel’s Plan Bee Body Polish uses very fine sugar to give your body an even, sandy exfoliating experience. I typically exfoliate my body once or twice a week, usually on days when I shave my legs (TMI?) to really help open up my pores and prevent in-grown hairs and bumps. Plus, I just love how extra soft and luxe my skin feels post-shave and post-exfoliation. While I always apply body oil while my skin is still damp post-shower, I find that I really don’t need to after I’ve exfoliated with Rachel’s Plan Bee Body Polish. It’s just a nice extra if I want some additional moisture, but for the most part, this takes care of my hydration needs. Now that’s what I call a perfect flippin’ body scrub. Rachel’s Plan Bee sent me two different scrubs to try. Both scents — Coconut Beach and Vanilla & Spice — were absolutely lovely, but according to which one is closer to being empty, I liked the Vanilla & Spice Body Polish better! If my memory serves me correctly, the Vanilla & Spice was a limited release, made with the most intoxicating vanilla aroma. Here’s to hoping Rachel makes it again soon — or even adds it to her permanent collection of body polishes. 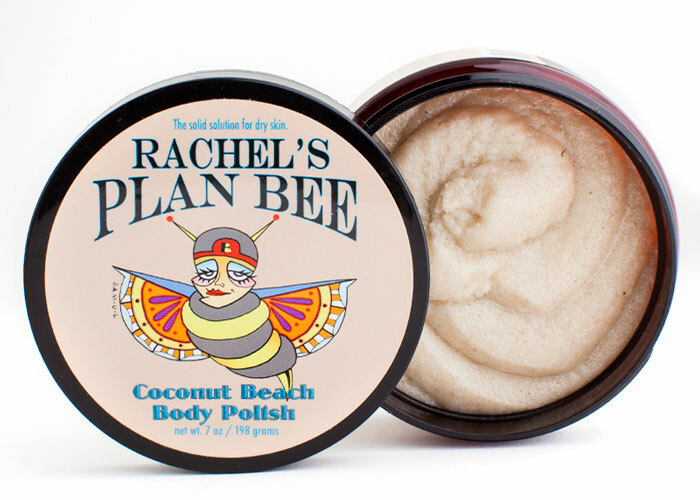 I’m looking forward to restocking Rachel’s Plan Bee Body Polishes (even though I have several others in my shower, I know). Citrus Breeze and Lavender Mojito look like they could be winning scents! Why must I always be attracted to the limited edition runs of everything?! At $16 a pop, I can easily try all the different scents Rachel makes without blowing my skincare budget. This is one of the most fairly priced, fun lines around. On the repurchase and recommend list for sure! Have you tried anything from Rachel’s Plan Bee? What do you look for in a good body scrub? What scents are you drawn to? Tell me in the comments section.